In Britain, Calls To Regulate A Freewheeling Press The British voice mail hacking and police bribery scandal has led to calls for government regulation of the press in one of the world's greatest democracies. Perhaps surprisingly, though, the boisterous British press already operates under more constraints than their U.S. counterparts. The 168-year-old British tabloid News of the World shut down last July after a widespread scandal that involved phone and voice mail hacking. Now there's a debate about placing new regulations on the British press. The voice mail and computer hacking and police bribery scandal that has roiled the British newspaper industry has also led to calls for government regulation of the press in one of the world's greatest democracies. Some newspaper executives, such as Paul Dacre, editor of the Daily Mail and editor-in-chief of the Mail on Sunday, are attempting to draw the line. Dacre argues that newspapers play a central role in British society. Rupert Murdoch's News Corp. has a stranglehold on commercial satellite TV in Britain through its controlling stakes in Sky News and BSkyB, Dacre says. And he claimed that the BBC can be intimidated by powerful politicians because the government determines much of its funding. "Indeed, I would argue that Britain's commercially viable free press — because it's in hock to nobody — is the only real free media in this country. Over-regulate that press, and you put democracy itself in peril," Dacre told an ongoing and wide-ranging judicial review into the practices of newspaper journalism. But Alan Rusbridger, editor-in-chief of the Guardian, says some systemic changes are probably needed. The Guardian helped to reveal that voice mail hacking and police bribery were rife at the Sunday tabloid News of the World in the tabloid's quest for scoops. "We've arrived at a situation where the lawmakers say we have to have some boundaries," Rusbridger tells NPR. "And that's why we've had this perpetual discussion — and it's been going on for 40 years — about whether the press can police themselves." 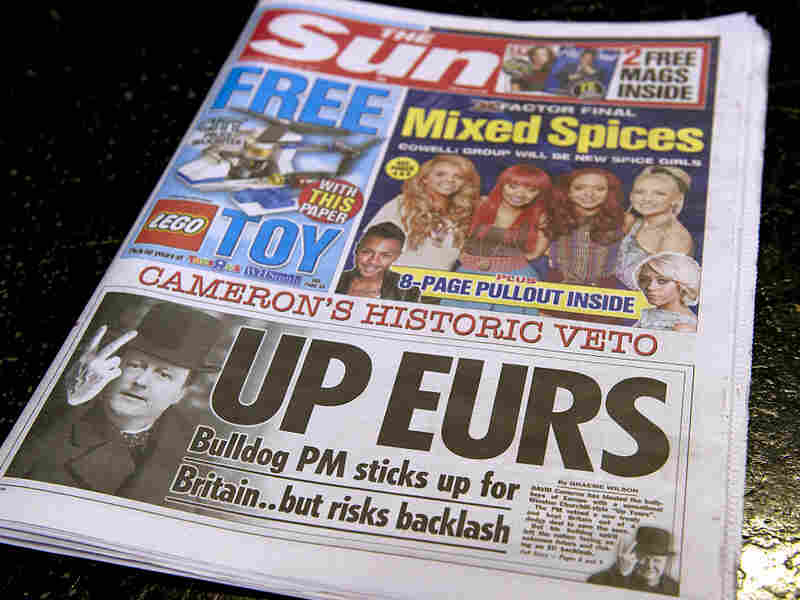 British tabloids such as The Sun are known for being brash, cheeky and salacious. By press, he means newspapers. But the boisterous British press already operates under far more constraints than their counterparts in the U.S.
Laws are on the whole much friendlier to plaintiffs who want to sue papers for libel. Judges sometimes issue "prior restraint orders" barring papers from publishing damaging stories. In the U.S., "prior restraint" is limited to restriction of articles about imminent national security threats. There also is a British Press Complaints Commission designed to determine whether coverage has been fair. But at key moments, the commission has proved toothless. Participation is voluntary, and it's dominated by newspaper executives. For years, the commission accepted at face value denials from the Murdoch media empire's British wing that its top-selling Sunday tabloid had committed widespread wrongdoing. This acceptance defied the Guardian's path-breaking reporting that showed otherwise. In fact, the commission chided the Guardian for reports that turned out to be true. Mark Lewis is one of the leading attorneys for hacking plaintiffs suing News Corp.'s British arm. He tells NPR that papers are seeking to deflect accountability by hiding behind the complaints commission. "We don't have any regulation. It's not state regulation, it's not free regulation, it's not self-regulation, it's no regulation," Lewis says. "There is no regulation to the press." On Tuesday, The Times of London, one of the most prestigious titles in Murdoch's stable, took a stance consistent with those who say self-regulation isn't working. The paper published a "leader," or leading editorial, calling for an "independent regulator" to replace the commission. It added this line about its corporate parent: "As the evidence of wrongdoing came to light, News International, Rupert Murdoch's company that also owns The Times, was unable or unwilling to police itself. This was a disgrace." The Times argued for that regulator to be free of control by the industry and the government, but to hold investigative and punitive powers. Until this crisis, British papers were largely celebrated for being salacious — cheeky, bare-knuckled, and even bare-breasted — and they're known for serving up gossipy scoops about political figures, celebrities and sports stars along with more serious coverage. There are 11 national newspaper titles, all based in London — a blend of New York, Washington and Hollywood all in the same metropolis. Competition is fierce and the well-known subjects plentiful. The press's salaciousness was among the very virtues stoutly defended by journalists such as The Mail's Dacre. "The courts must not ignore the fact that if newspapers do not publish information which the public are interested in, then there will be fewer newspapers published which will not be in the public interest," he said. In that instance, Dacre was citing a ruling by a senior British judge in a case involving a professional soccer player's romantic involvement with a lap dancer. Lord Justice Brian Leveson, the senior judge leading the inquiry, is expected to make his policy recommendations to Prime Minister David Cameron later in the spring. News Corp. executives shut down the News of the World last summer after the extent of the wrongdoing became clear, in an effort to show they could clean their own house. But such acts have failed to soothe angered subjects of tabloid stories and invasions of privacy. Take Gerry McCann. After his young daughter's disappearance in Portugal, McCann and his wife were besieged by paparazzi and subject to accusing stories. The couple won a series of libel awards. Now, as he testified to the judicial inquiry, he wants journalists to be subject to stiffer restrictions. "Information has been written — and lives are being harmed — by these stories — and something has to change," McCann said. "A commercial imperative is not acceptable." Rusbridger, the Guardian editor, says this crisis offers an opportunity for the British press. "Americans are much more ready to admit their own mistakes, and we have come very late to that party. So it's almost as if we have a culture in this country where we are less willing to take personal responsibility, and we wait for it to be imposed externally," he says.